This is a ver quick well loved meal for the family. It will totally please your Bacon lover as well. Reserve 2 Tbsp. barbecue sauce. Stack 1 each chicken and peach piece; wrap with 1 bacon piece. 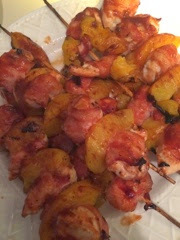 Thread onto skewers; brush with remaining barbecue sauce. Grill 12 to 14 min. or until chicken is done, brushing with reserved sauce for the last 2 min.